I have never had these before as I usually only have gummy bears that are hard and chewy. These Bassetts' ones were soft and had white icing sugar on them. 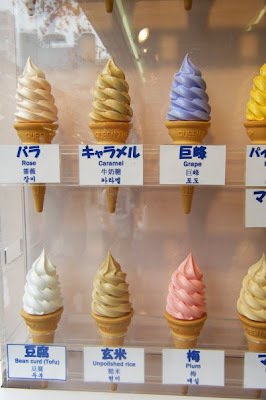 It was very weird to eat them - and my colleague at work thought it was strange to have never had them before. I didn't like them - I prefer hard, chewy gummy bears - especially the Haribo ones. It just felt wrong to have the light dusting of icing sugar on them. Ick. Layer pasta, cheese, ground beef, more cheese, sauce and some green peas and bake! You then get pasta forno, which would be called pasta casserole in English. A hearty and delicious lasagna type meal which always tastes better the next day. Best Use of Labels CANs Ahoy! 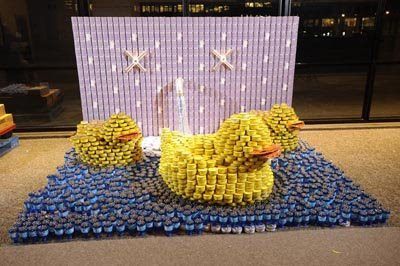 Canstruction is a yearly event that pits competing architectural and design agencies against one another to see who can come up with the best structure from cans, hence the name can-struction. They are usually quite impressive in person and the planning and assembly take weeks and weeks. 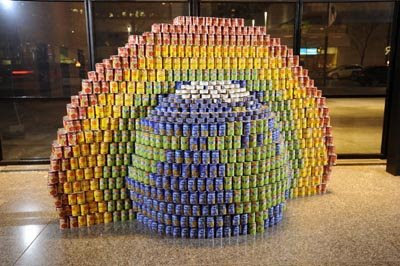 All the cans of food are then donated to local charities or in the case of Toronto, the Daily Bread Food Bank. The competition started in 1992 in the US, and is now in 125 cities across the US and Canada. 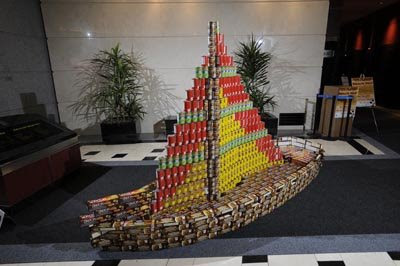 Doesn't it make you want to head to Costco and buy cases and cases of tuna and make your own dolphin for your living room? Maybe that is an activity for Christmas day instead of going to the cinema. St.Albans' street market Only 20minutes outside of central London by train, you can visit the markets of St. Albans, here are some pics of my last visit there which was on a Saturday morning. The street market is held in Market Place and St Peter's Street on Wednesdays and Saturdays, as it has been for many hundreds of years. 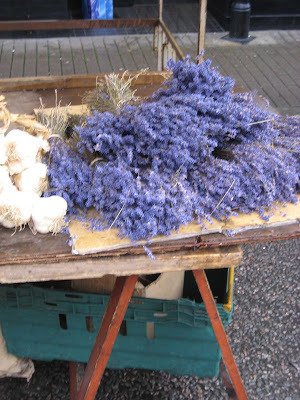 There is also a monthly farmers' market, normally on the second Sunday, and a French market every four months. I always love the vibe, sights and sounds of a street market and just visited Borough Market on Saturday after a very long time -yes even on a chilly winter day it was packed full of people! And Happy Birthday Dearest Sister!!!! 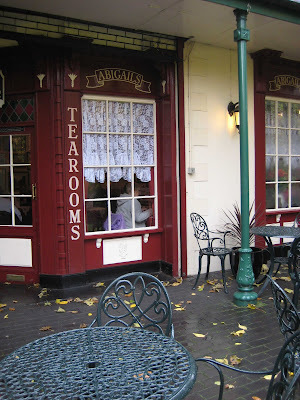 Abagail's is a quaint little tea room tucked in a corner, siting within The Village Arcade and has a little patio overlooking the greens of the Abbey of St. Albans. 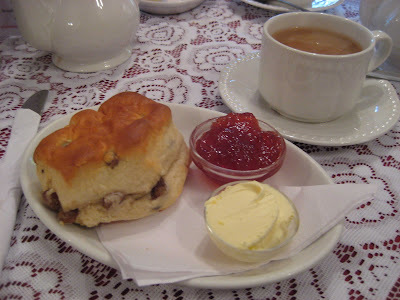 They serve the usual: cream teas, coffees, cakes and biscuits and also regular light lunch and dinner food. It feels as if you take a mini step back in time at this place or like you are having tea at your Gran's. 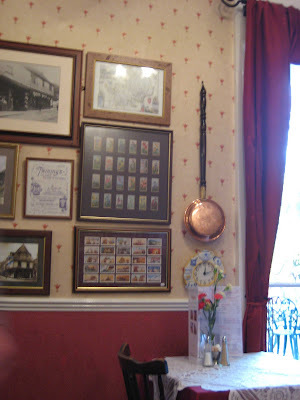 There are old photograph's and stamps on the wall along with lots of frilly lace and red and pink colors surrounding you along with patterned carpet and wallpaper, v.cute! It is a very British place and most likely has been around for ages, check it out - although if you don't like a little old school then don't go, grab a latte at the Starbucks on the high street instead. I was lucky enough to win tickets to a Chelsea game a week or two ago, seats were in the executive suite which included pre game drinks and dinner, half time drinks and dessert and more food and wine at the end of the game. Not a bad way to see the game indeed, although I may have overindulged a little on the brownies, cookies and mince pies at the end! I wasn't too impressed with the actual dinner, I ordered a curry which wasn't too tasty, but the desserts and wine were superb. There were some Chelsea players around for pre-game people watching and some interesting characters seated at our table who made the night entertaining. It was my first football game in the UK and was quite an experience, I think it was a Premiership game? It was similar to the games that I went to in TO for the Toronto FC, but 100x more raucous, rowdy and fun. You can feel the passion of the fans here much more. Fans from opposing teams are seperated and made to use seperate gates; with lots of riot police, police on foot and police on horses you can feel the excitement and tension in the air, I never knew we had that many police in the city?! Quite an experience and a great game that went to penalty kicks. 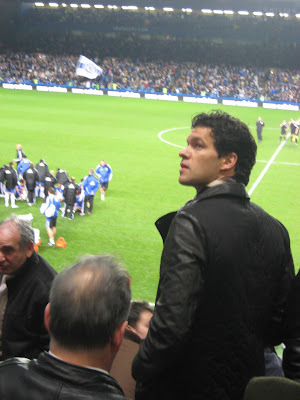 We even sat a few rows behind the glitzy and glam German footballer, Michael Ballack - he's quite the pretty boy. Our wine was a 2004 Rioja from Spain called Dinastia Vivanco. The wine ages for 16 months in French and American oak barrels and then spends another 6 months in the cellar. I recommend trying it as it was fab, you can also visit the Vivanco family's website to find out more. Had a lovely lunch here today at this little gem in Kensington Square. It is so fresh and clean inside and has a very Californian feel to it. 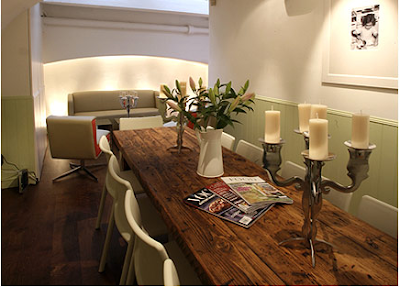 I love the interior decor and the light and fresh menu was great. I had a club sandwich, which you rarely see on British menus. 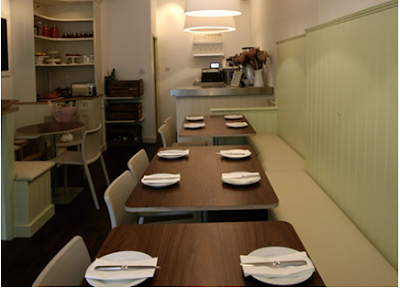 Kensington Square Kitchen is a must visit if you are in the neighbourhood doing some shopping. I think it is even owned by a lovely Kiwi. Will definitely go back for some tea and dessert soon. The table below is where our team, prior to my arrival unfortunately, used to have a weekly Monday morning breakfast catch up. Due to the credit crunch, now we just hover around the Nespresso machine (which I must admit makes a fine cuppa). 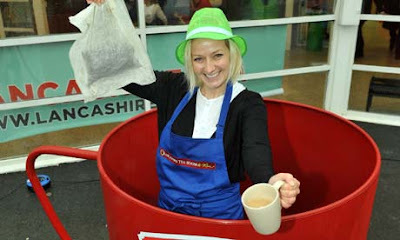 In Preston new records for the largest cup of tea (400 litres) and largest tea bag (60kg) were set, and in Camden Lock the longest line of pizzas ever (285.5m) was created (who comes up with these categories?). Elsewhere, Anita Schwarz thought her dreams of bringing the 'most beer steins carried' record back to Germany had been cruelly shattered after she managed to carry 19 giant foaming mugs only 40 metres, but the adjudicating powers created a new category in recognition of her efforts and she is now the official record-holder for 'most beer steins carried over 40 metres – female' (they really are making this up as they go along ...). Also in Germany, 5.4 litres of juice was extracted from grapes by treading in just one minute by teutonic treading titan Martina Servaty, beating Belgian Tijs Vandoorne into second place for the coveted (and imaginatively named) 'most juice extracted from grapes by treading in one minute' record. And in New Zealand, two separate records concerning the time taken to peel and eat kiwi fruit fell - the 'fastest time to peel and eat three kiwi fruits' is now, officially, 36.91 seconds (an astonishing average of 12.3 seconds a fruit) and the world's 'fastest time to peel and eat a kiwi fruit' now stands at 16.15 seconds, both feats achieved by Alastair Galpin (that's 16.15 seconds for a single fruit? Hang on a minute ...). What is Quinn Jr. eating? It gracefully slid off the sword and landed in Quinn Jr, the Bunny, Quinn Sr and my plates. We all gave it a try and it was very interesting indeed, a bit rubbery but a tasty little bauble of goodness. 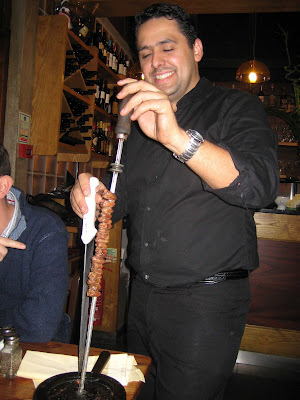 It was a tiny chicken heart that was barbecued to Brazilian standards, served up at Rodizio Rico on Westbourne Grove in Notting Hill. I think my food inhibitions have been removed after my tripe and lamb brain trials earlier this year - so why not a chicken heart? We eat pate all the time, non? And that is a mix of duck or chicken liver and other interesting condiments. I was arguing with the Quinn princess that there is no difference between liver and heart and that the liver is something that purifies one's toxins while the heart is the organ of love - this didn't work and she still didn't try it. If you want a big night of lots of barbecued beef, pork, chicken and lamb then go to the Rico. 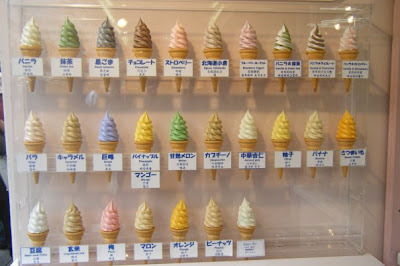 For 20quid you get all you can eat and it is really tasty. The salad bar was a bit salty but is only filler and apparently the real Brazilians don't eat that stuff they just go for the meat that swirls around the tables carved up by servers brandishing large knives. Don't be afraid - unless you are a vegetarian! 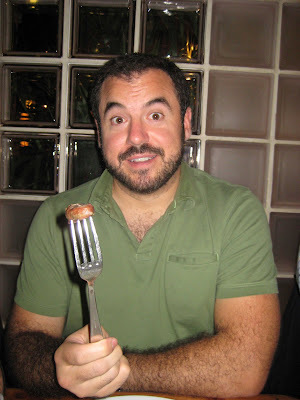 Pork or beef rump, rind, steak or something - who could keep track?! 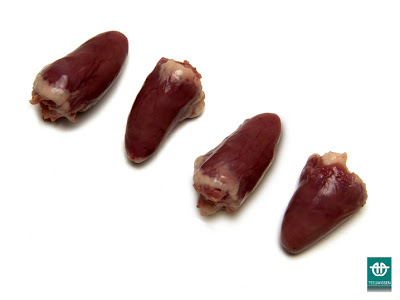 chicken heart photos from the net- teeny tiny. From Tim Hayward at the OFM blog. His bit about PR stunts is so true, especially for a slow news day. Get a formula in a press release and you usually get coverage! Pick up a copy of the Metro any day of the week and you will find a survey, a formula and a picture led story which is usually wacky and grabs readers' attention. Tim writes: "I'll be honest here at the outset. I used to work for a PR company that made something of name for itself as the originators of that greatest of stunts, the 'Formula Story'. It was a simple and brilliantly effective trick. There's nothing a hassled journalist with a deadline loves more than a nice meaty 'scientific' formula. It looks great on the page, it has a wonderful quasi authority to it and laying it out in big type - or best of all, in chalk on a blackboard - gives you a lovely cheap, space-filling illustration. It was a sure-fire hit. It seemed that the press would print almost anything we set up. We had formulas for the perfect bacon sandwich, the most likely day of the year for a successful marriage proposal and a rigorous mathematical proof of the anaphrodisiac effect of underarm moisture, all paid for by bakers, internet dating companies and deodorant manufacturers. We had a little black book of media-friendly academics who, for a suitable emolument, would assign a research assistant to creating a formula. The best were so media-friendly or hungry for departmental publicity that they'd even give a couple of meaty quotes-to-camera wearing a white coat or a comedy bow tie. These days, I make a lot less money on the other side of the fence but you'll forgive me for being more than a little cynical about any news story that features a scientist coming up with a formula for anything - if I read a headline saying that Einstein had discovered that energy was equal to mass times the speed of light squared, my eyes would flash to the end of the story to see which power company was behind the release. 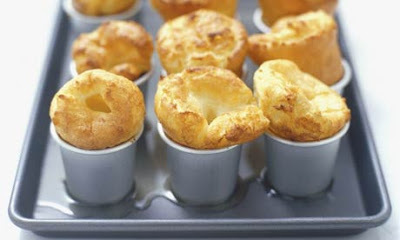 So imagine my delight at yesterday's story of a scientist opining on the perfect Yorkshire pudding. I scanned the copy for the name of a flour company, a purveyor of powdered gravy or the Yorkshire Tourist board and found nothing but the Royal Society of Chemistry and John Emsley, a scientist from Yorkshire, sharing a perfectly innocent recipe. I can't tell you how clean and redeeming that feels. A story based on nothing more than geekery, love of food and regional pride. I can't, even at my most venal and cynical, see it having any underlying commercial point beyond a little well deserved profile raising for the RSC - and if the Royal Society of Chemistry have turned the filthy ways of PR to their own ends, then, good on them. The Quinn's The Quinn's were in town this weekend so there was a lot of drinking and dancing. 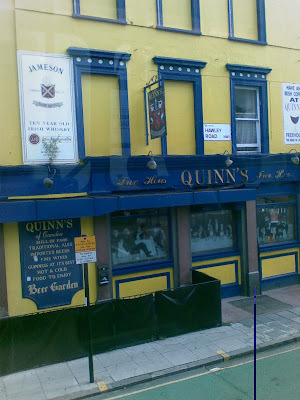 Mr. Quinn can shake it alright! 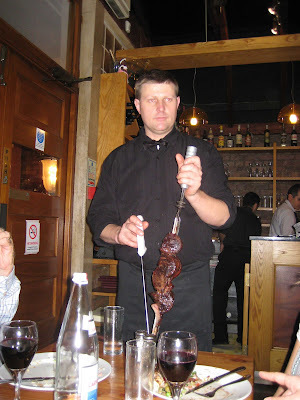 We also went to a Brazilian barbeque restaurant in Westbourne Grove and ate very large quantiies of beef, pork, lamb and more - we even sampled the chicken hearts. 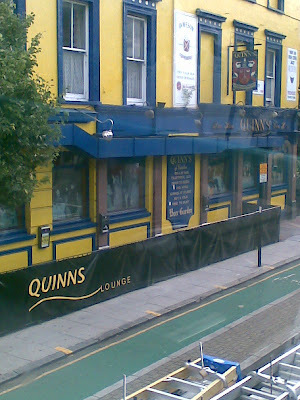 More pics to follow, we are all just trying to recover... Pics are of a pub in Camden called Quinn's. Caroline's favourite cheese Maybe it's the Irish in her that makes her eat funny foods, but she keeps telling me to blog about this cheese, I think it is nasty but am happy to see it thrives on the black market. I recall reading somewhere that a man attributes his good health to eating pidgeon every day - so...to that and to this maggot cheese I say, 'to each his own!' May your stomach rot in gastronomical delight. 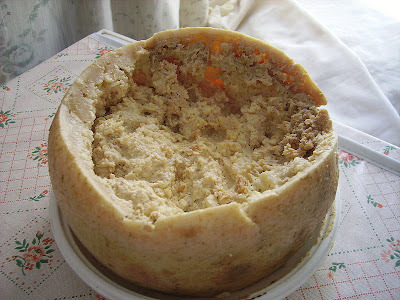 Casu marzu (also called casu modde, casu cundhídu, or in Italian formaggio marcio) is a traditional sheep milk cheese, notable for being riddled with live insect larvae. Although outlawed there for health reasons, it is found mainly in Sardinia, Italy on the black market. Casu marzu literally means "rotten cheese" in Sardinian and is known colloquially as maggot cheese. Sarde Sicilians do like their sardines! The pics were taken at a food market in central Palermo. There were fresh sardines filleted and ready to grill and tinned, salted sardines. Sardines on toast is such an easy dish to make. Take salted sardines add them to fresh bread adding some fresh tomato slices or tomato sauce and you have a delicious meal. For those who don't have that you can use tomato Ketchup. Fresh sword fish. After a long and tiring day with no inspiration for what to make for dinner I passed the fish market in Notting Hill and bought a slice of swordfish. I quickly pan fried it with lemon and a drop of olive oil and voila, a healthy, delicious and quick meal. 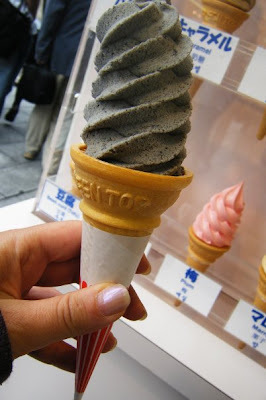 Toasted black sesame ice cream and some other interesting flavours - photographed by my friend Diana on her latest adventure to Japan. 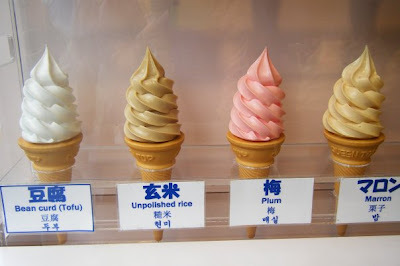 Flavours: plum, bean curd, unpolished rice, caramel, rose, grape and more! My substitute turkeys Instead of buying a frozen, massive turkey which would take 2 days to defrost (and the packaging had a hole in it) I opted for 2 fresh, free range, Waitrose chickens. I lathered them with garlic, fresh tarragon, salt, pepper and roasted them with olive oil, carrots, onions, sweet potato and regular spuds. Served with bruschetta to start, stuffing, vegetables and vegetarian lasagna it was a fantastic belated Thanksgiving dinner. I started cooking at 11am and didn't stop til guests arrived at 7pm - that is a long day of peeling and preparing, my respect for housewives significantly increased that day! Then there was the lemon meringue pie that the Bunny made, which should and will have its own post. It was delicious! There was lots of wine consumed and it was a great evening with the NHG and the other London family members. The Yanks are celebrating Thanksgiving soon so hopefully I will get invited to another dinner - maybe this time there will be turkey! Fichi d'India Freshly picked, peeled and eaten right on the Puzzo farm. 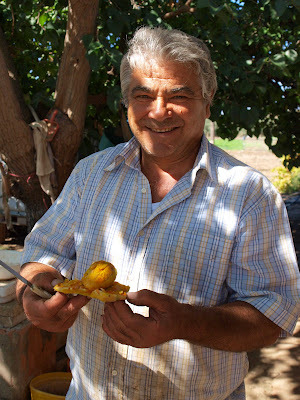 Prickly pears, opuntia or as the Sicilians call them fichi d'India are delicious. You must peel them carefully otherwise you get the spini (spines) from the cactus plant in your skin and it is painful (I got one stuck somehow). I ate about 4 of these in a row and thought that was my limit although I haven't had one since that sunny day and now wish I'd had more. I think they will be around at Christmas so looking forward to some imported ones. I also like the red ones as I like the way they stain your fingers and lips. The best way to eat them is as is - freshly peeled - when they are chilled they give a fresh sensation to your mouth, along with all of the seeds. A must try. It would be a progressive tax: the fatter the taxpayer, the higher the tax. The top of the "normal" range for BMI is 24. A BMI above 25 would pay a small surtax, say 5 percent, BMI 30s would pay 10 percent, etc. The brilliance of Art Laffer's flat income tax notwithstanding, a flat fat tax simply would not work, since it would not encourage weight-control once the taxpayer's BMI was well above the taxation threshold. To deter falsified BMIs, IRS doctors could offer a second opinion. BMI audits might be required at three or six-month intervals to get an accurate reading of each taxpayer's average BMI during the year, and to prevent unhealthy fasting during the tax season. And given the latest research showing obesity spreads socially, the IRS could even demand friendship data (cross-checked) to ensure individual friendship networks don't exceed a particular fat-friends quota. Unlike communism's poor, capitalism's poor are generally fat, and the very poor even fatter. 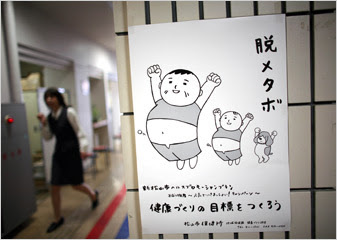 Indeed, up to one third of the three-year-old children in low-income families are reported to be fat or obese. Thus, to ensure its efficacy, any fat tax should be a bottom-line item on Form 1040, paid after all deductions and credits. For many obese, poor people, the passage of the fat-person tax may be the first time they've ever filed a 1040 with a positive liability: an especially poignant incentive to lose weight! The lovely Carolina got us tickets to the Frieze Art Fair, which was held in Regent's Park a few weeks ago. It was wacky and wonderful and the Deutsche Bank VIP lounge was also lovely. We had champagne and a lovely meal that ended with this exquisite apple tart. We almost didn't have time for the art! Momma Dolce once happily reported that the Parrot had a job at Douche Bank and ever since that incident when I burst into laughter and corrected her, I cannot look at the company's sign anymore without saying it like that. Sometimes the artists were more colorful than their art. Smoking indoors, I could see Bobbalina being paid to do this.